So I thought it might be an idea to share my where I’ve come from and where I’m hoping to get to. As a teenager I was extremely slim. At one point I was probably actually underweight having developed some issues around food following the break-up of my parents’ marriage. At this time it felt like I didn’t have control over much that was happening in my life, but I had control over what I ate. A typical daily intake for me would be a small bowl of dry cereal, a dry bread roll or a bar of chocolate for lunch, followed by a small ready meal such as a frozen lasagne or packet of Super Noodles for dinner. Paradoxically, I would also binge eat being easily capable of polishing off half a large pizza, a quarter of a cheesecake, 2 donuts and some chocolate on my weekly visits to my dad. I continued this eating pattern until I was about 16 years old when I began to adopt a more healthy approach to my diet, eating, on the whole, 3 meals a day. I always made sure I chose low fat options, never chose creamy sauces or used butter and rarely ate chocolate or drank alcohol. The weight started to creep on when I got together with my boyfriend. We would regularly go out drinking heavily at the weekend and get a pizza on the way home then have a McDonalds breakfast to help cure our hangovers the following morning. When we moved in together, the scales crept up further. I cooked meals for us and dished up equal portions even though he had an active job and took part in martial arts while I worked in an office and did very little exercise. We also lived over the road from a convenience store and so it was all too easy to pop to the shop for a chocolate bar or a bottle of wine. that I was now struggling to do up my size 18 jeans. I vowed I wasn’t going to go up to the next size and decided to do something to tackle my weight. The photo that made me realise I needed to do something about my weight. I started off doing my own thing, doing a bit of exercise and going back to eating more healthily. I lost 6lbs but I was finding it difficult. Then one day I saw an advert for Weight Watchers on TV and thought it was worth a try. I phoned up to find my nearest meeting and found there was one nearby that night so I went and joined. I was horrified when I stepped onto the scales and found I was heavier than my home scales told me. 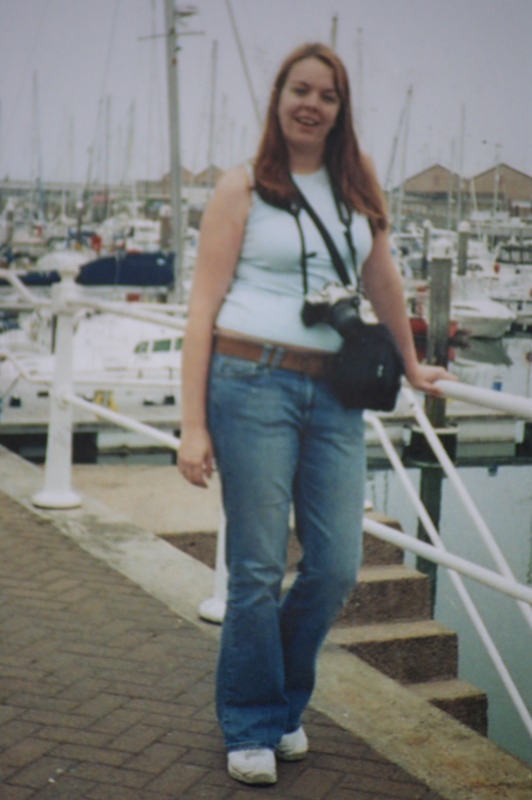 I’ll never forget seeing that figure – 13st 9lb. And I realised that, having already lost 6lbs, I would have been over 14st at my heaviest. Initially I had great success and soon achieved my 10% target. Feeling confident that I had all the tools I needed, I stopped attending meetings and decided to go it alone. Before long I veered off track and put most of the weight back on. This led me into a cycle of re-joining, losing, stopping and gaining which lasted for a couple of years. I knew that when I stuck with the plan it worked but I just couldn’t find the motivation to keep going. Two years after first joining, I’d been back at Weight Watchers for about 6 months. I’d lost some weight again and was feeling good. However, I was just about to give up work to go to Uni full time and I was facing having to stop my membership again as I wasn’t sure I’d be able to afford it. At this point my leader was looking for a clerk and so I on this role. I was able to attend meetings for free and being a clerk meant that I would attend every week, even if I’d had a ‘bad’ week. I’ve attended consistently since that time and although my weight has fluctuated and I’ve still not yet got to my goal, I’ve never put all the weight back on. In December of 2011, my boyfriend proposed. Of course I was excited to be marrying my soul mate but I was also excited that the wedding would give me the motivation I needed to finally get to goal. Or so I thought. In reality, between the proposal and the wedding I lost a grand total of 3 lbs! So, that pretty much brings me up to date. 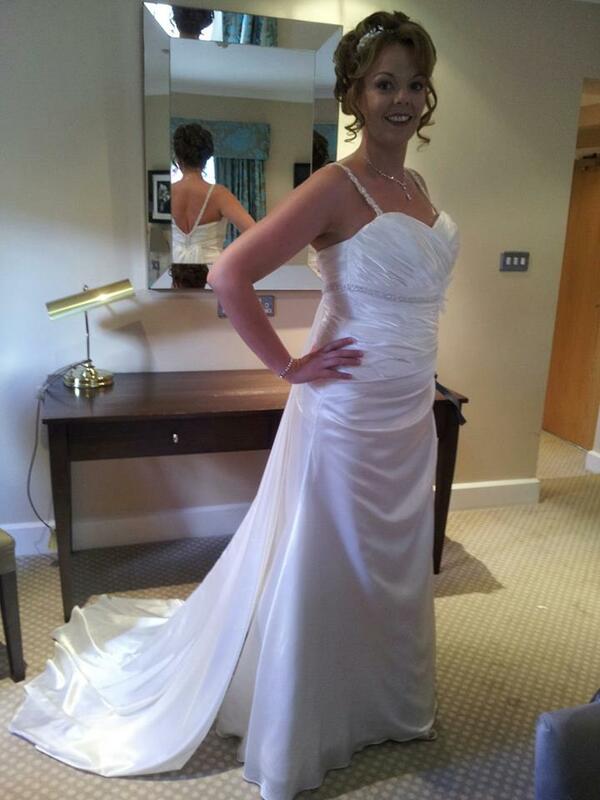 We got married in August 2013 and although I had a great day and felt amazing, I am a little disappointed that I wasn’t at my goal weight for it. So I’ve decided to really go for it this year. No more messing about. No more excuses. I AM going to get to goal! My wedding but not at my goal weight. Thanks 🙂 I wanted something that wouldn’t be too hot in the 40+ degree heat (we got married on a beach in Turkey) but I still want it to be a ‘proper’ wedding dress. I loved it and it’s only just gone up into the loft yesterday! Ah, you must mean 40 C. My 40 degrees F is freezing COLD! It’s a beautiful dress. I love it. I know how it feels to put on the weight from being with someone new. When I was close to 20 my boyfriend and I would regularly get Taco Bell and other fast foods and I’d always match him in quantity, sometimes more. The same thing happened all over again when I started dating my husband! We just kept enabling each other. Good luck to you on this journey! You looked beautiful in your wedding dress even if it wasn’t your goal weight. Just imagine how you will look in your favorite clothes later on this year!